Not all cakes need to be sweet! This Savoury Parmesan Basil Tomato Cake is delicious and wonderfully memorable. You’ll crave this Parmesan flavoured cake studded with burstingly fresh cherry tomatoes and fresh basil all summer long! 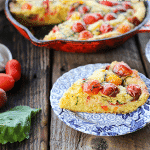 Whip up with grape tomatoes in the cold months for a taste of warmth! Cake. People love it, right? Piles of frosting and decoration might be pretty, but I love my savouries far more than my sweet. Why should sweet cakes have all the fun and glory? 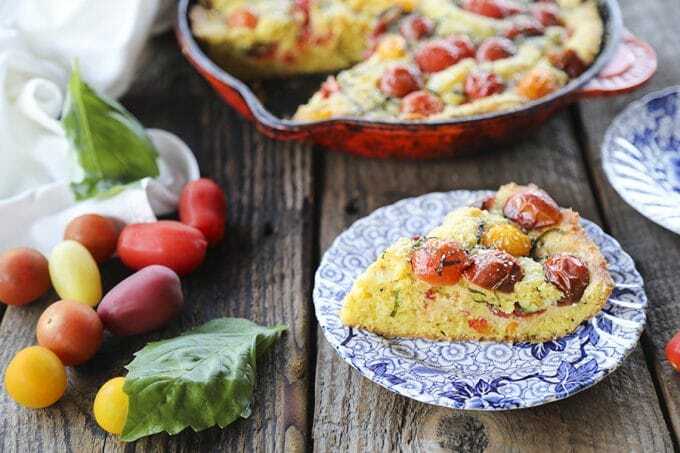 Adding the glory of bountiful summer cherry tomatoes and fabulous, fresh basil to a rich, savoury, Parmesan pound cake makes a show stopping, eminently craveable, gorgeous treat. How do I make a savoury cake? It’s pretty simple! 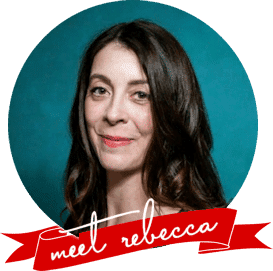 Think of your normal sweet cake recipes, minus the sugar and plus delicious umami-packed ingredients like Parmesan cheese, extra virgin olive oil (or preferably garlic extra-virgin olive oil), and fresh herbs. When do I serve Savoury Parmesan Basil Tomato Cake? I like it for breakfast with a fried egg, for lunch with a handful of berries on the side, or as part of a light summer dinner with a salad and some grilled fish or chicken. It’s fresh, flavourful, and absolutely amazing. This Perfect Simple Grilled Fish, this Greek Lemon Garlic Chicken, this Pizza Salad, this Bresaola Parmesan Salad, this Tex Mex Cobb Salad, this Cheeseburger Salad, this Blackened Salmon Caesar Salad, this Fattoush Crumbled Pita Chip Salad, and this Zucchini Salad Spiralized would be spectacular with it. What kind of olive oil do I use to make Savoury Parmesan Basil Tomato Cake? As I mentioned briefly, I truly prefer garlic extra virgin olive oil. If you cannot find it locally and don’t want to order it, you can substitute any tasty extra virgin olive oil you have on hand. What kind of tomatoes do I use to make Savoury Parmesan Basil Tomato Cake? I prefer to use fresh farmer’s market cherry tomatoes, and the prettier the better, but grape tomatoes will also do the job, if you want a taste of summer in the colder months. And if you have a super-abundance of fresh tomatoes in your garden, you can roughly chop those big, beauties and treat them the same way you would the cherry tomatoes in the recipe. It’s almost impossible to over-beat the Parmesan cheese, softened butter, and olive oil. It’s important that it be smooooooooooooth like buttah before you add the eggs and flour. Equally important is that once the eggs have been added, you don’t over-beat it once the flour mixture has been added. I know, don’t sweat it one minute, don’t over-do it the next. Just use a wooden spoon or sturdy spatula to add the flour instead of beating it with a stand mixer or hand mixer. While I give a baking time of 30-45 minutes, you really want to watch the cake starting around 25 minutes. The reason for this is that different tomatoes will have different levels of moisture, so they’ll give off more or less liquid which will pretty drastically affect the baking time. Please don’t be tempted to cut the cake right when it comes out of the oven. The aroma is positively enticing. I get it. I mean, you can skip the cool-down if you plan on eating the entire thing in one sitting but the finished cake texture counts on cooling in the pan. Not all cakes need to be sweet! 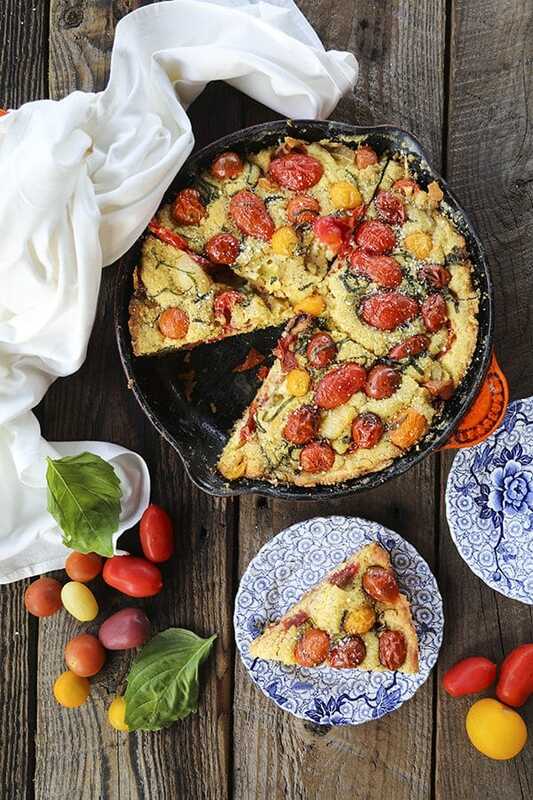 This Savoury Parmesan Basil Tomato Cake is delicious and wonderfully memorable. You'll crave this Parmesan flavoured cake studded with burstingly fresh cherry tomatoes and fresh basil all summer long! Whip up with grape tomatoes in the cold months for a taste of warmth! Preheat oven or Traeger to 350°F. Use 1 tablespoon of butter to grease a 10-inch cast iron skillet, coat with flour, tap out excess flour, and set aside. Add the halved or quartered cherry tomatoes to a colander over a bowl. Use your fingers to scoop out the seeds. Sprinkle 1 teaspoon of the kosher salt over the tomatoes and toss to coat. Let them drain over the bowl while you prepare the cake. In a small mixing bowl, whisk together the flour, baking powder, remaining salt, and black pepper. In a stand mixer fitted with a paddle, or in a large mixing bowl with a hand mixer, beat together the Parmesan cheese, butter, and olive oil at medium speed until very light in colour, about 5 minutes. Add the eggs, beat on medium speed until evenly combined and smooth. Use a sturdy spoon or silicone spatula to stir the dry ingredients in just until no dry pockets remain. Spoon half of the batter into the prepared pan. Spread gently to smooth the batter. Shake the tomatoes in the colander to remove any excess moisture. Arrange half of the tomatoes over the batter. Sprinkle half of the basil over the tomatoes. Dollop the remaining batter over the tomatoes, smooth gently, then arrange the remaining tomatoes over the top. Brush the tomatoes with garlic olive oil, then scatter the rest of the basil over the top. Bake for about 40 to 45 minutes in a standard oven or 30 minutes in a Traeger, or until a skewer or thin knife inserted in the center comes out clean. Let cool completely in the pan before slicing and serving. 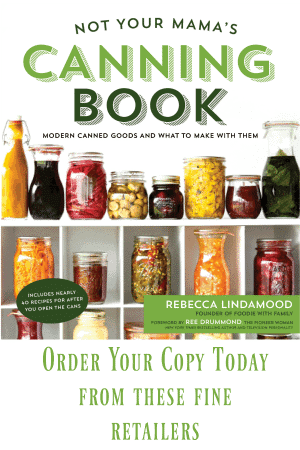 Leftovers can be stored tightly wrapped or in an airtight container at room temperature for up to 5 days. super summer dinner for us! 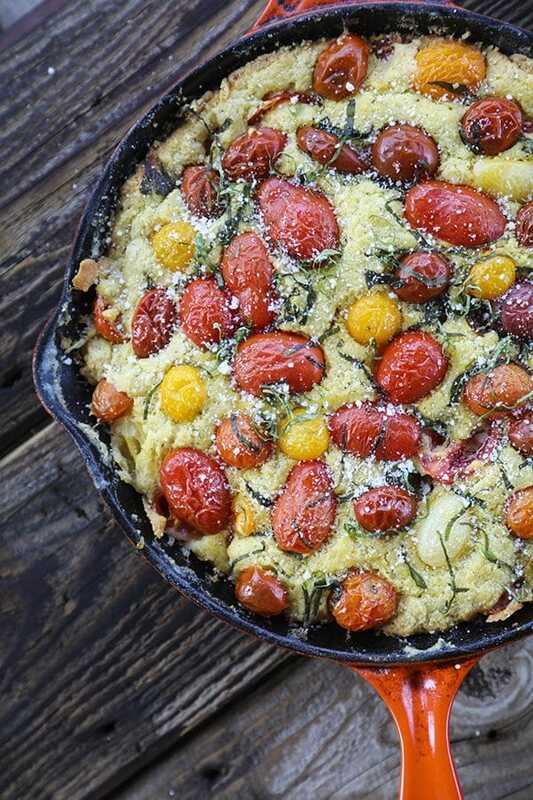 Wow, this savory parmesan basil tomato cake looks delicious. Yes, not all cakes need to be sweet! Now, I want to try this cake for the breakfast. Thanks for the step-by-step introduction. My family will love this dish.